Nice one, Wayne! When I heard you guys were headed to Lanikai yesterday, I wished I could have joined you to rekindle some of those old memories. We all used to fly there a lot, but I guess the wider windows of flyable conditions at Makapuu and Kahana have tempted us away from the original paragliding site on Oahu. I got my first taste of paragliding there in a tandem with Pete in 1999. 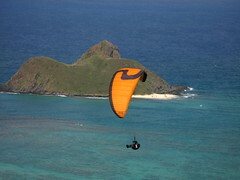 Lanikai has always had its share of shortcomings: a steep hike, followed by a launch in the venturi near the top of the ridge, a limited figure eight flight pattern on most days, and finally a small landing zone that's super crowded on the weekends. Let's not even mention the sailboat masts. But on the positive side, the aerial view of Lanikai and the Mokuluas is world class. It's also very conveniently located for many of our pilots who live in or around Kailua. It's flyable there in very easterly conditions when Makapuu or Kahana may not be working, and on those days we enjoy a little more airspace over the east bowl. But perhaps the best kept secret of Lanikai - on good thermal days our best pilots have headed over the back for XC missions to Makapuu or towards Kahana. In the old days I was way too chicken to try it myself, but now I think I'm ready to give it a shot, as long as I have some company, of course. I really felt good flying at Lanikai after such a long time away. The hike wasn't bad (due to the excitement of flying there again). The wind was a bit east (ENE) and about 8 to 10 on the beach so, it was a bit bumpy and gusty due to the rotor(s) and venturi from the Mokulua islands being directly upwind of us. The grass really needs a good whacking, but you can still see the old ground cover underneath. 2. Be careful of launching in ENE on the east bowl, due to the rotor off of the spine. It can be real bumpy, especially considering the spine is also the house thermal generator. 3. If you sink out in the east bowl there is no beach. It is better to side hill land in the Kaiwe at the bottom of the hill. 4. Do not fly too close down the ridge to the golf course. Especially if you are low. The venturi can be very strong with no lift. 5. The park at the base of the hill is surrounded by Heco lines, and tall trees. It is Not a good LZ. Also there is strong rotor off the houses in front. If in an emergency you have to land there use big ears to get in the park and expect a tail wind when touching down. 6. When leaving the ridge it is always better if you fly straight out to the beach, then turn left to the LZ. 7. Do not fly too far past the LZ downwind its hard to get back sometimes. Also watch out for Ms. Gurney (Dan Gurneys cousin) she's the lady who will chase you off of her beach. 8. If you get blown over the back - fly downwind to the back of the golf courses middle fairway and turn into the wind. The will pick you up and bring you back to the parking lot. 10. Another fun flight is to get about 1,200' and fly down Kailua beach, landing in front of Buzz's steak house for a beer. Or trying to land on a kite surfing kite at kite beach, just to show them who's the air boss. I can remember all of Reaper's instructions for the place. Lanikai has an LZ that is hard to beat for party atmosphere and scenery. I think the ridge that pokes out into the center of Lanikai holds a prospective high wind, low launch. If it were my neighbor hood I might make it happen. The current low launch is a venturi and is windier than above. Nightshift and Lori, thanks for the pictures, especially the ones with the cool guy flying the orange glider! I always wanted to go back to Lanikai to shake out the evil spirits. It was the scene of my worst launch EVER! I flew there on Sept 11, 2006 with Seattle Ray. I had 3 takeoffs and landings that day, but only planned 2. I was building my wall in the East bowl and totally got my wing out of shape into the Keave trees. The wind was pretty strong and my A's and C's technique at that time still had a long way to go (still does). Anyway, my lines are *hopelessly* tangled in the trees. Ray climbs down to help me untangle. Next thing you know, the Keave branches simultaneously gives my glider the heave ho and then my glider does a nice little pirouette, and decides to launch itself! Hope floats, or in this case flies! I’m not sure what bothered me more at that point, the two twists in my risers or the fact that the glider accomplished on its own what I could not on purpose. Instinctively I make a steering input with my brake toggles…and it sticks! I’m in an uncontrolled right turn back into the hill now. It’s happening very fast and I’m just concentrating on the impact now. I slam into the 6’ kieave feet first and my glider goes nose first *neatly* into the trees. Wow! Not a scratch on me! Ray comes up to me and calmly states: “You can flip the glider over”. At this point I know I’m not dead, unless Ray talks to dead people. No flipping the flipping glider! One autopilot flight is enough! Afterwards I’m angry at myself for not keeping a grip on my C’s at all times. I should know better, coming from N. Cali...where the Delta breeze is just as bad as the moderate trades. I set up and launch again for my 3rd flight. I was awarded with a really nice landing where the shadow of my wingtips slotted themselves on the backs of two nicely proportioned sunbathers. The cold beer at the Shack was oh so good.